Established and owned by William Flynn, of Cork City, was "The Hibernian Chronicle". This Journal was printed and published by James Haly. The final issue was of which was the, 1st January 1801, the same year the proprietor died. Along with him went his Journal. After the demise of the Hibernian Chronicle it then became the "Cork Mercantile Chronicle", and once again printed and published by James Haly, the first edition appeared in 1802. 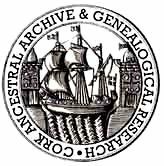 Upon its re-branding, the ownership of the paper was held by Thomas Townsend, a Protestant Barrister-at-Law. He later took over the ownership of the "Dublin Correspondent". "The Editor of the New Cork Directory, to render every future edition as correct and complete as possible, will thankfully receive and diligently attend to any alterations that may become necessary, through death, removal, partnership, &c and request they may be transmitted in writing, (previous to the month of October) to The Print-Office, King’s Arms at the Exchange, where a book is open for the purpose for entering them." The final entry of this directory states the print-office was located opposite the Exchange. The site of the Exchange is now occupied by today’s YMCA where North and address South Main Street meet at the corner of Castle Street.The most likely location of the King’s Arms Print-Office may well be near or where today’s Horford building stands. One of the earliest known important publications of Haly’s was by Francis Moylan, entitled; "to the lower order of the Roman Catholic inhabitants of the Diocess of Cork", published 1799. The book business was not only limited to catholic publications. Another of his clients and friend was Presbyterian Minister Thomas Dix Hincks (DD) (1767-1857) of Prince’s Street. At least two of his works; Letters addressed to the inhabitants of Cork, entitled "The age of reason", 1795 and in 1798, "On dwelling together in unity" a sermon preached at the Protestant Dissenter’s Meeting-House, Prince’s Street, of Sunday morning 1st July 1798 were also produced by James Haly. Both men from 1792 were active Committee members governing the Daily and Sunday Schools of the city established by; Hincks, Reverend George Armstrong, James Carr, and James Haly; who was probably the only catholic to be involved with the administration and running of this society. Subsequently, Haly became a prominent participant of Francis Moylan’s and John England’s Charitable Society, when in 1807 they purchased a plot of land on …. Marsh and established the Lancasterian based upon the Quaker Joseph Lancaster’s mentoring system. 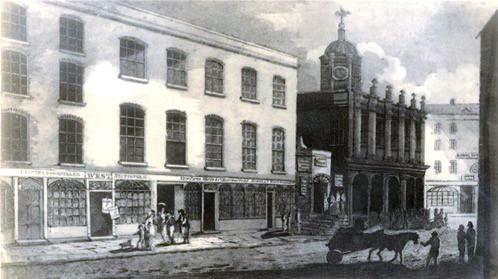 In 1802, the Cork Mercantile Chronicle appears to have been produced from both; North Main Street and 12 Patrick Street. The newspaper’s header itself states 12, Patrick Street; today St Patrick Street. Situated at 12-15 now stands Roche’s Store, founded by William Roche in 1909, but now occupied by Debenham’s Store. This building sits on the site of the Mercantile Chronicle office at no 12. This newspaper was the written mouthpiece for the Liberator O’Connell, and his emancipation efforts through the Catholic Association, originally established by Francis Moylan and his fellow bishops. As a very young Catholic Prierst, John England, under his Bishop authority, held the editorship for many years. He was subsequently consecrated the first Bishop of South Carolina, 1820, and exiled for his political views and agitations by Bishop John Murphy, Francis Moylan’s successor. Well that is to say; this is the considered opinion as far as the author is concerned. Additionally, James Haly was one of Cork’s best Book-Sellers. Nowhere in his correspondence does John England make any reference to James Haly. Nor for that matter do his previous biographers. William Trant Fagan, MP; author of his version of "The Life and Times of Daniel O’Connell", on the other hand gives a lengthy account of Thomas Townsend activities in relation to an article produced by the "Dublin Correspondent", which Daniel O’Connell himself became embroiled. In doing so, he establishes a connection between James Haly and the "Cork Mercantile Chronicle", stating that John England; "became proprietor, for the benefit of Haly’s widow and family.